CHANLER, John Winthrop, (father of William Astor Chanler), a Representative from New York; born in New York City September 14, 1826; received his early education from private tutors, and was graduated from Columbia College, New York City, in 1847; attended the University of Heidelberg, Germany; studied law; admitted to the bar and practiced; member of the New York state assembly, 1858-1859; nominated as a candidate for New York state senator in 1860 but declined; unsuccessful candidate for election to the Thirty-seventh Congress in 1860; elected as a Democrat to the Thirty-eighth and to the two succeeding Congresses (March 4, 1863-March 3, 1869); censured by the U.S. House of Representatives on May 14, 1866, for insulting the U.S. House of Representatives; died at "Rokeby," Barrytown, N.Y., October 19, 1877; interment in Trinity Cemetery, New York. Papers: 1845, 1 item. A letter to John Winthrop Chanler from his mother and sister, who with his father attended the inauguration of James K. Polk in Washington, DC. In the letter, the mother describes a visit to the White House and expresses opinions on what she has heard about him. Chanler, John Winthrop. Down with the black flag of confiscation. [Washington: N.p., 1867]. ------. Freedmen's Bureau. Washington: Printed at the Congressional Globe Office, 1866. ------. Speech of Hon. 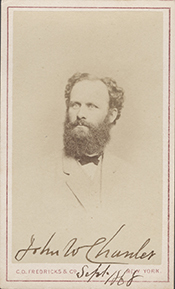 John W. Chanler of New York delivered in the House of Representatives, February 3, 1866. Washington: Congressional Globe Office, 1866. ------. Speech of Hon. John W. Chanler, of New York, on the proposition to amend the enrollment act. Washington, D.C.: McGill & Witherow, printers, 1865. ------. This is a white workingman's government. [Washington: N.p., 1866].